Hair loss needs internal treatment. Research-proven homeopathic treatment offers excellent treatment for all forms of Hair loss. It amazingly controls further hair loss in six to eight weeks. Dr Rajesh Shah, M.D.(Hom.) has been working on a range of chronic disease conditions including hair loss. His research-based new molecules have international patents. 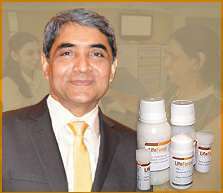 Dr Shah's patients in over 145 countries have been benefited by his research-based formulae and it works wonders. Hair loss, either patchy (alopecia areata) or diffuse can be controlled with great effect. However, baldness cannot be reverted; it can be controlled. The individualized treatment is based on the study of patients patches, extent, cause, genetic pattern, emotional sphere, hormonal imbalance, and other factors which lead and maintain the disease. What do you achieve by this treatment? Treatment of local cause such as dandruff or psoriasis, etc. The treatment addresses all the factors that govern hair loss, such as nutrition, stress, genetic factors, etc. Baldness and Alopecia Totalis (universalis) do not respond to homeopathy.